What Works for Weight Loss: Negative or Positive Feedback? A few weeks ago TV broadcaster Jennifer Livingston in LaCrosse, Wis. defended herself against Mike Thompson, a viewer who criticized her as not being a responsible role model since she is overweight and is a public personality. He asked her to reconsider her responsibility to promote a healthy lifestyle. Livingston made a public response where she said she’s more than a number on a scale, and that Mr. Thompson was out of line with his email. I asked many of you what you thought about her story, and while some of you said he was out of line and was being a bully, others thought he was merely speaking the truth or providing constructive criticism. While the dust has settled on that exchange, the story brings to the surface a great weight loss question for discussion: What’s more motivating, positive or negative feedback? Painful … but motivating? Some of you commented on my Facebook page that sometimes hearing the truth—even from strangers—can be painful, but motivating. It makes sense because oftentimes people get so caught up with work, kids, stress, life that their personal health becomes the last thing they think about. Exercise, unfortunately, is the first thing that falls off of a daily routine when people are in a time crunch. 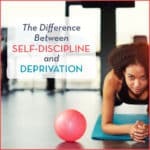 When that happens or when people go on automatic pilot, not really paying attention to their eating habits, lack of exercise or what it is doing to their bodies, it can sometimes take a jolt from someone else to wake up about daily decisions and the toll they take on our health. In that regard, I can see how the brutal truth can be a motivator of change. Is there a fine line? On the other hand, I think there’s a big difference between your sister encouraging you to exercise with her or keep food journals together, vs. a random email or post from a stranger telling you that being overweight isn’t setting a good example for other people. It’s just bad boundaries and inappropriate to go around making judgments about people without knowing their back story—or more importantly—them. I think it’s great to encourage family and friends to make healthy choices, as long as it is done in a respectful and encouraging way. It’s never productive to only criticize. Positive … but tough. I am wired toward the positive and have been since I was a kid. Glass half full has been my motto forever and maybe I’m over optimistic at times. But, I love positive quotes, inspirational images, seeing the best in people, and encouraging people with kindness and support to live healthier lives, and realize their potential. I believe you can attract more bees with honey. I think positive input leads to positive output. Having a positive mindset doesn’t mean I let people off the hook. I am positive and tough. I believe people should be tough on themselves and get honest about the choices they are making and how those choices are impacting their health. I think people should take responsibility for their health. I am not into excuses. As a fitness trainer, I believe there’s a balance to strike between encouragement and being tough. I do believe that those four words, “I don’t have time” are worthless and I tell my clients to switch those four words to this, “I choose to do something else I feel is more important.” Ouch! It is a bit of a reality check. Are your health and happiness not important? I try to get them motivated with baby steps. I have always believed that in order for people to keep a habit, they have to enjoy it! What do you think? What motivates you to live a healthier, better life? Are you the kind of person who would rather have a trainer screaming in your face or someone smiling and encouraging you? Let me know, but I can’t end this blog without telling you …. YES YOU CAN!